The new concept introduced by Fujitsu smartphones, technology companies from Japan. 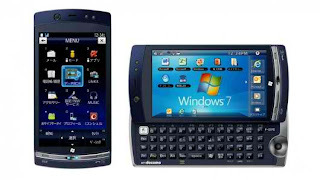 They introduce dual-boot Windows 7/Symbian named Fujitsu LOOX F-07C. NTT DoCoMo is equipped with Windows 7 complete with Microsoft Office 2010 licensed 2 years. Fujitsu claims the phone is also the world's smallest PC that is ready at any time in the hands of users. Smartphone Fujitsu has a display 4-inch SVGA touchscreen (1024 × 600 resolution), Intel Atom Z600 1.20GHz processor, 1GB of RAM, 5.1 MP camera and 32GB of flash storage. There's also a USB port for connecting a keyboard or mouse, and an HDMI output jack for connection to an HDTV. They also offered to users to switch from 'Mode Mobile Phone' (Symbian) to the 'Windows 7 Mode' and vice versa enough with just one touch. 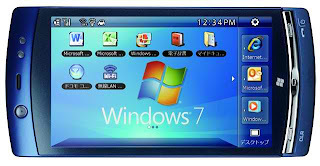 According to the company, this device has a function similar to a PC, with Intel Atom processor, Windows 7 OS, Microsoft Office 2010 two years of personal licenses, and the latest version of Internet Explorer 9. Currently the F-07C Fujitsu LOOX marketed by NTT DoCoMo in Japan, and we hope it who knows could stray into Indonesia. For now, this phone will only be available in Japan (the price of about ¥ 70,000 or about USD 7.3 million. A fair price for the smallest PC in the world.